Wow! This was a mighty impressive and fascinating bicycle trip. I wish I had been there! WHO: Michael Romanow, 53, and Gary Kelly, 53, both of Westwood, Mass. ; Trond Skramstad, 47, of Newton, Mass. ; and Curt Allen, 51, of Marlow, N.H.
WHERE: Burma (also called Myanmar). WHEN: Two weeks in February. TOUR FOR FOUR: Although the men were on an existing tour, they were the only travelers, and had two assistants and a Burmese guide, Melvin. “Melvin really loved his country and knew a huge amount about the central part, where we were, and was a great resource about Buddhism. He rode with us a few times, but mostly he drove,” Kelly said. The foursome brought their own hybrid bikes, and shared the mostly paved but rough roadways with ox carts, tractors, pedestrians carrying goods on yokes on their shoulders, mopeds, and buses. CULTURAL HARMONY: At Inle Lake they saw floating gardens and fishing villages on stilts. “There was silk weaving, silver making, and rolling cheroots, like cigarettes,” Romanow said. “The work was all labor intensive.” They took a balloon ride over Bagan, dotted with thousands of pagodas. 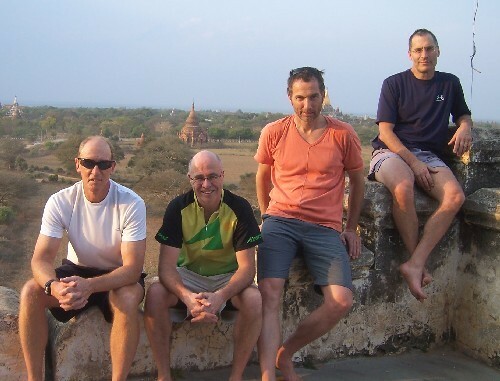 “Bagan was probably the biggest tourist area, with mostly Australians and Europeans,” Kelly said. In and near Mandalay, they watched locals promenade the almost mile-long teak U Bein Bridge and saw hundreds of red-robed monks line up for lunch at the famed Mahagandayon monastery. “The Buddhist presence was just amazing,” Romanow said. 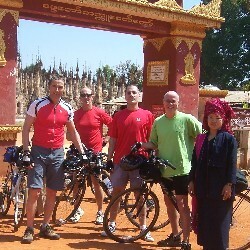 This entry was posted on August 7, 2008 at 8:21 am and is filed under Asia, Bicycling, Where they Went. You can follow any responses to this entry through the RSS 2.0 feed. You can leave a response, or trackback from your own site. You are living your dream and that is fantastic. We are in the Chicago area….. come visit!